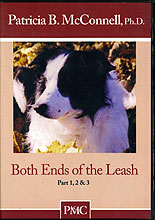 This 3-part DVD series of a one-day seminar by Dr. Patricia McConnell focuses on the behavior of the animals at BOTH ends of the leash. The seminar, which is full of demonstrations and practical ideas, combines an understanding of canine ethology and learning theory to help members of both species understand one another. Using a balanced mix of slides, videos and lots of hands-on demonstrations, McConnell provides fun, positive and effective ways to teach dogs to do what we ask, and to teach humans to make sense to dogs! This video series brings the ideas in her latest book, "The Other End of the Leash," to life, and is full of the same humor, knowledge and love for both species.